I have a book coming out soon, and I look forward to sharing it will all of you! "God calls us all to answer to the personal call to holiness in our lives by loving and trusting Him with all of our hearts. Once we recognize that we all have a call to follow Him we ask ourselves: What vocation is God calling me to in the Catholic Church; priesthood, consecrated life, single life, or married life? What can I do to be able to discern God’s voice in this noisy world? What is the plan that God has for me for my life? How can I offer my gifts and talents to the Lord in a way that is fulfilling God’s will?" 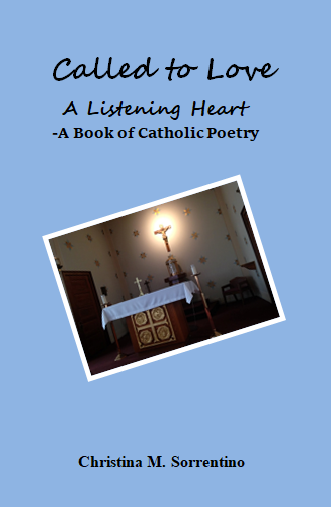 This book of poetry has been years in the making, and I am grateful to have the opportunity to share through poetry my Catholic faith journey with you in experiencing all of the beauty that Catholicism has to offer us, along with the challenges, questions, and joy that comes with discernment of one's vocation. I first discovered my love of writing, especially poetry, in elementary school, and by high school I was entering poetry contests and having my work published in student anthologies. I hope the poems in this book will inspire you to enter into a deeper relationship with Christ, consider the calling that God has for you in your life, and then respond to that call.